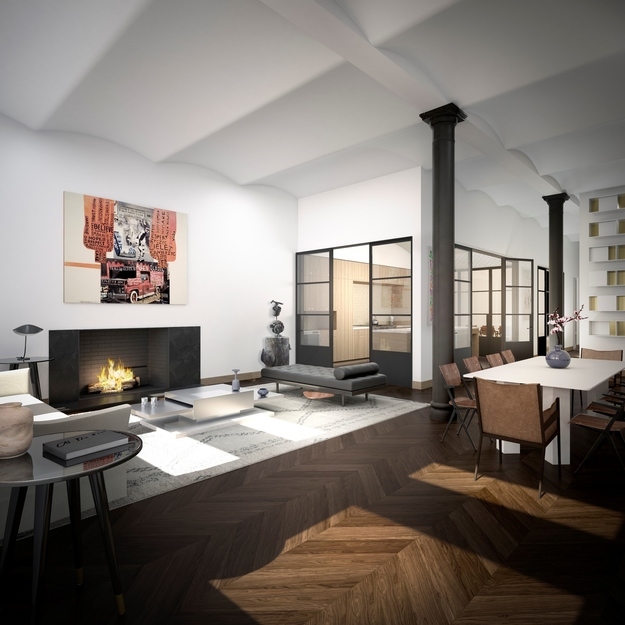 The website and floorplans are out for very Frenchy, very luxury condo conversion 37 East 12th Street in Greenwich Village. Originally constructed in 1896, the eight-story, 25,878-square-foot building was acquired by Edward J. Minskoff Equities (EJME) for $26.6 million. The deal closed in March. The sale price translated to approximately $1,028 per square feet, record pricing for a conversion property in the area. EJME converted the 37-foot-wide building, previously occupied by antique showroom Kentshire Galleries, into six residences. Jason Chai of CS Architecture oversaw the property’s restoration, design and interiors. The expansive units consist of four 3,028-square-foot two-bedroom “flats,” a 5,886-square-foot three-bedroom townhouse and a 6,325-square-foot duplex penthouse. Interiors have barrel vaulted ceilings of 11 feet and higher and double-hung tilt-turn windows with transoms on the third through sixth floors. Also present: five-inch walnut flooring in a chevron pattern, wood-burning fireplaces, kitchens with rift white oak cabinetry and exotic-y materials including honed Calacatta marble, Betig Azul limestone, custom cast Moroccan tile and tumbled Lagos Azul marble reclaimed from the original Museum of Modern Art facade. Each home has a humidification system for preserving artwork, furnishings, architectural finishes and general personal well-being. All residences have private express risers leading to a secure room in the cellar. 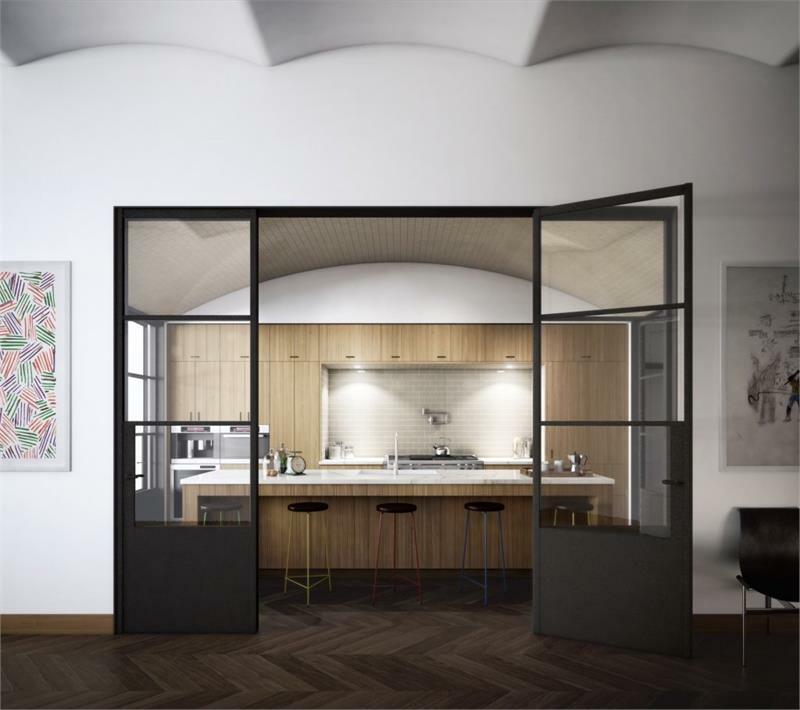 Inspired by the monumental apartments along Boulevard Haussman in Paris, the four flats have electronically keyed elevator entry, steel and glass doors, vaulted barrel ceilings and exposures from the north and south sides. The four-bedroom, four-bathroom duplex penthouse has a gallery measuring more than 18 feet long, library, formal dining room and a kitchen with a 7′ by 14′ skylight. There’s also a 1,188-square-foot private landscaped rooftop terrace with views of the Empire State Building. The three-story townhouse boasts a great room with wood-burning fireplace, custom steel and restoration-glass French doors, eat-in kitchen leading to a landscaped loggia and a “private garden” in the rear. 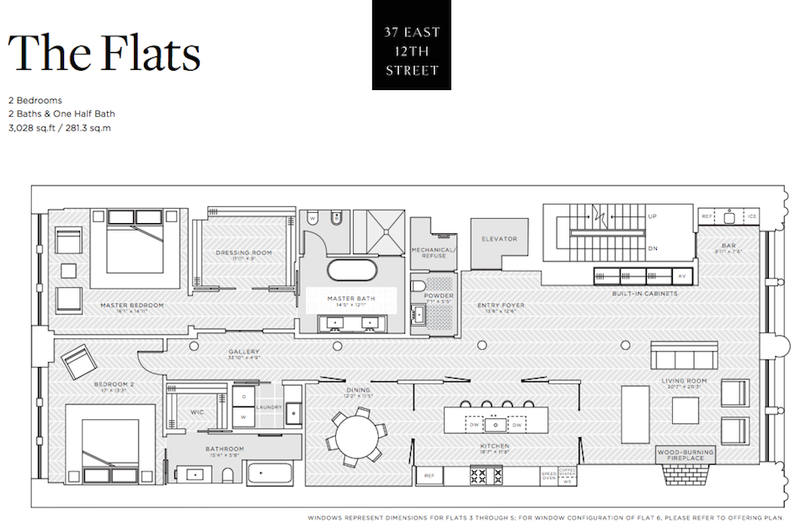 Amenities include a 24-hour doorman, concierge with white glove service, gym and private storage for each apartment. An auxiliary generator provides uninterrupted use of the elevator, heating, air conditioning, select appliances and multiple outlets. Landscape design is by Lindsey Taylor, and Douglas Elliman is handling sales at the property. Floorplan below for the two-bedroom flats. More floorplans here. No info yet on the penthouse.